When planning one of the Alaska cruises that are available, there are many choices of cruise lines as well as ports that you may visit. One of the best cruises is the Carnival cruise to Alaska. They will do everything they can to make sure that your trip is fun and eventful. If you have never been to Alaska before, it’s a good idea to know some basic tips that will make your trip fun and exciting. Here, we have compiled a list of the top ten Alaska cruise tips from senior cruisers. 1. Definitely bring layers of clothing. This is especially true if you get cold easily. The weather in Alaska is unpredictable at best. Even on its warmest days, it doesn’t usually go over 70 degrees. The best time to cruise to Alaska if you don’t like the cold is in July and August. This is one of the most important of the Alaska cruise tips. 2. Be sure to bring comfortable sneakers or sturdy boots. Most excursions will include a lot of walking over uneven terrain. 3. Bring binoculars. If you don’t bring these, you’ll regret it. Even while cruising by the coastline, there is a lot of natural beauty and wildlife that you will want to see. This is also true of the whales. You will most likely have several chances to enjoy watching the whales. 4. Plan your Alaska cruise shore excursions ahead of time and be sure to coordinate the time of your excursion with your time of disembarking of the ship so that you’re not wasting time waiting or miss your excursion all together. 5. One of the most important of all the Alaska cruise tips is to bring a camera with plenty of extra batteries as well as an extra SD card. You will be amazed at how fast you fill up a SD card during your cruise. 6. If you are a first time cruiser or over 55, be sure to ask about discounts. This also includes military discounts as well. 7. Make sure that you bring a waterproof jacket and small umbrella. Alaska is well known for its damp weather, so you need to be prepared. 8. Plan your cruise in advance if possible. 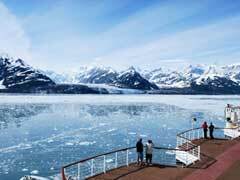 You will usually get the best cheap Alaska cruises if you book in advance. This will also lock in your price if there is a change in the price of cruise. 9. Travel with a companion. If you are not married or in a relationship, bring a friend along. Many cruises may offer a companion free deal. 10. Be sure that you bring extra money or a credit card to use during your shore excursions. Many times you will not be charged for these until the actual trip. Also, you will want to make sure that you have enough money for souvenirs. If you follow these informative Alaska cruise tips, you will have a wonderful trip that you will never forget.